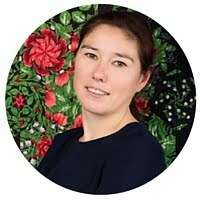 Jumping on the bandwagon of the Bloggers' Quilt Festival, I want again to say a great big thank you to Amy Ellis of Amy's Creative Side for all the time and effort put into organizing this event! 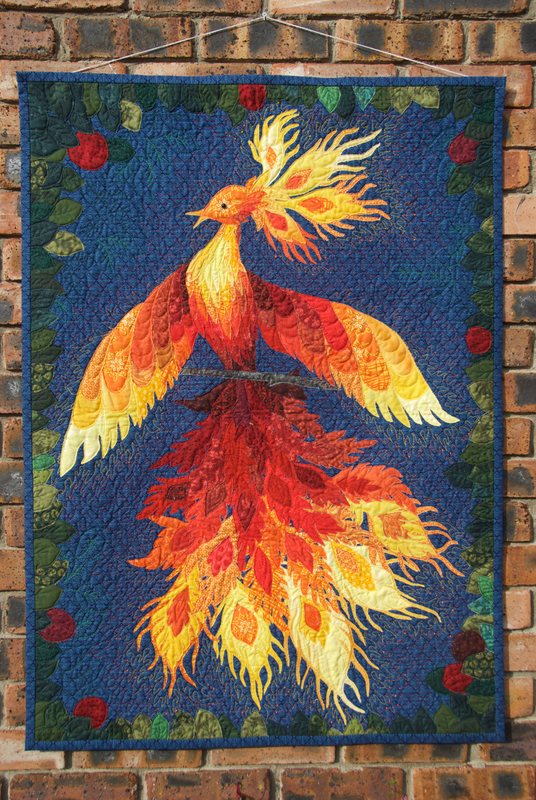 With my second entry to the Bloggers' Quilt Festival I was at a loss as to the category it suits best, being a small quilt (32'' by 44''), an appliqué quilt, an original design and something of an art quilt, too (quilt show categories generally seem bewildering to me). Well, I decided on the Appliqué Quilts category, because raw edge appliqué was the technique used, and I find that it did a good job creating the feathery texture. Firebird is a character in an old Russian folk tale that became famous due to Igor Stravinsky's ballet. This colorful and appealing image and has been used by artists many times, illustrating the tale, creating ballet costumes, other works of art as well as symbols and emblems. Here is an article with lots of Firebird illustrations by various artists from various times. What appealed to me in this image was the opportunity to play with color/value gradation to create an effect of glow. I had some scraps of yellows, reds and oranges left from my sampler, but I also asked my brother to bring some more from a shop in Moscow, which in addition to by-the-yard and precut quilting fabrics stocks scraps and remnants - ideal when you're doing appliqué. I also asked for "something dark green or dark blue" for the background and my brother brought me this beautiful piece which fitted the bill perfectly. I worked on this piece in Kharkov, Ukraine, under the supervision and with advice from my dearest teacher, Svetlana Kachalova. I made a life-size sketch in color pencils to see where I'm heading, but didn't have any templates or piece-by-pice plan. I chose the fabrics for every feather and then just cut the shapes free-hand, layering and stitching them to the assembled sandwich. I started with the tail - the lower larger feathers that had to appear underneath the others, then moved on to the wings, the body and the head. 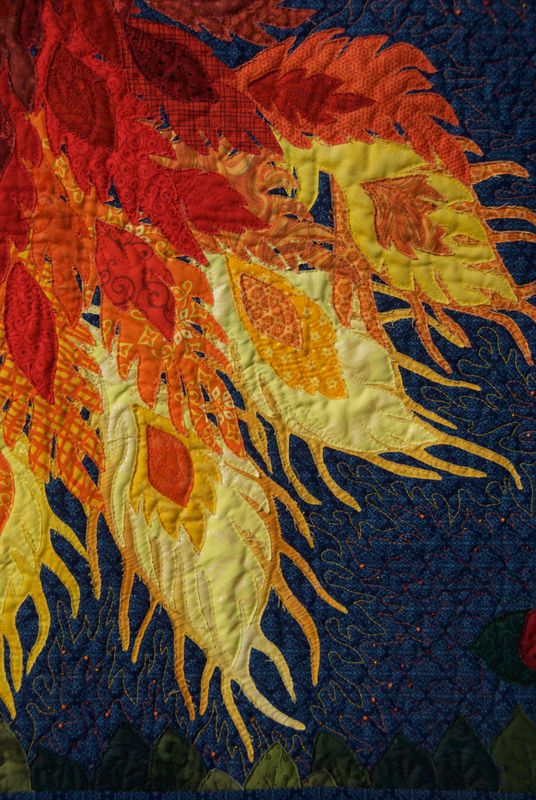 To enhance the glow (and heat))) effect, I quilted the background in shades of yellow, orange and red as well, then added some seed beads to represent fire sparkles. 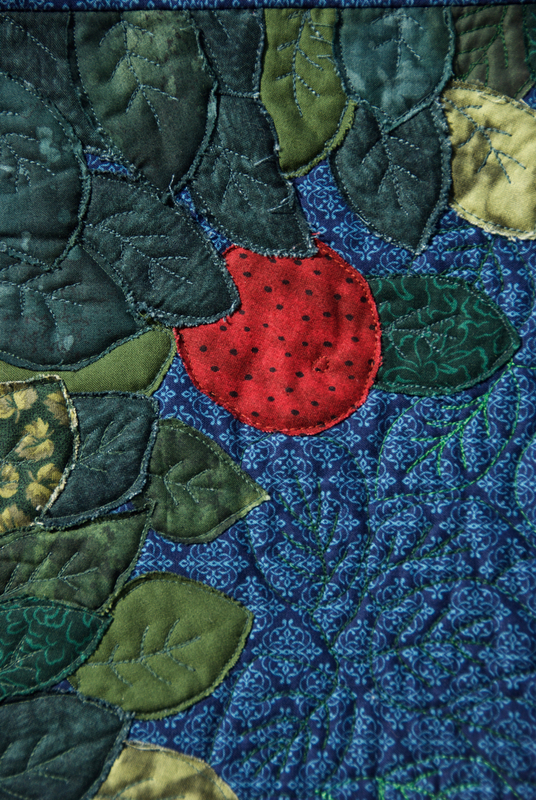 In the tale the firebird was stealing apples from a garden, so I bordered the quilt with appliquéd apples and leaves and some leaf-shaped quilting to fill in the remaining space. The leaves are mostly dark, being in the shade, but those that come close to the bird's feathers are lit up. Once again, don't forget to visit the Festival and vote for your favorites next week! Beautiful, beautiful quilt. 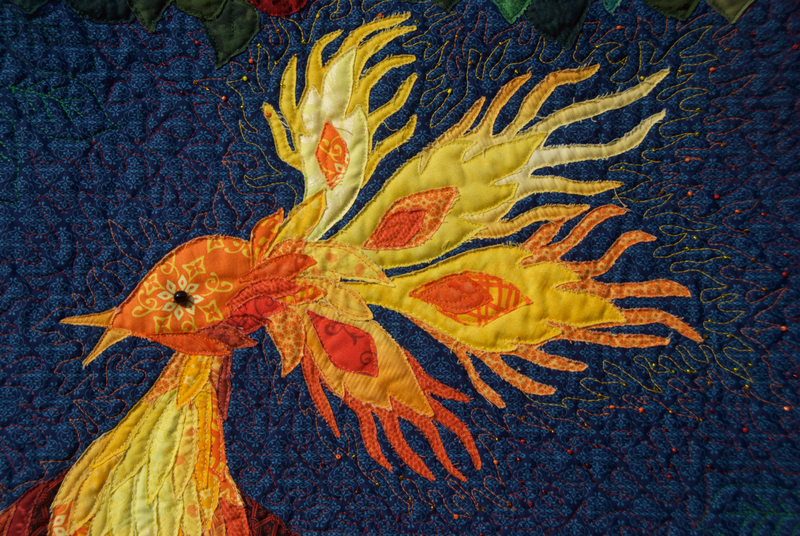 I love the little details - like adding the yellow and orange quilting and beads around the edge of the firebird. Gorgeous! Your technique is very impressive. Lena, he really does look like he is on fire! And the fussy cutting for his head is perfect! Stunning! You did an amazing job on your firebird. Very lovely creation. Beautiful finish! I love all the details you've added in there - thank you for sharing! What a lovely piece! Those reds and oranges are just great. Thanks for sharing! This firebird is beautiful! I like how you enhanced it with thread painting and beads. It's beaituful, the close up shots really make me want to see this in person! Stunning! 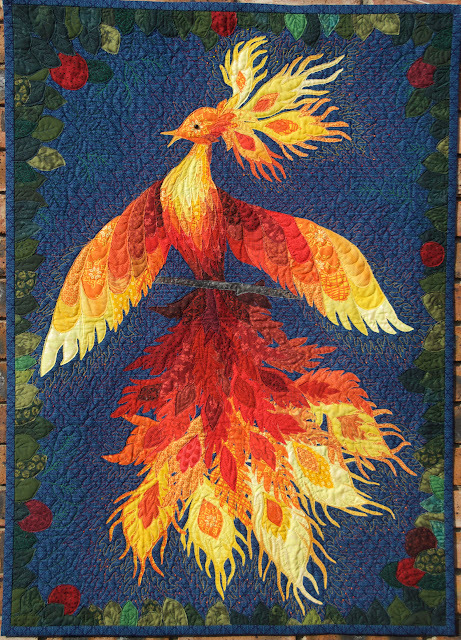 I really like the way you used your quilting to add more 'heat' to the overall design - very clever. You did a magnificent job Lena! The thought you put into color placement paid off because the whole quilt glows! Love the sparks and the way you lit up the leaves that were closer to your firebird. What a treat it is to see this quilt! Definitely my favorite! You have my vote, and I loved reading how you made it. It's a gorgeous heirloom! 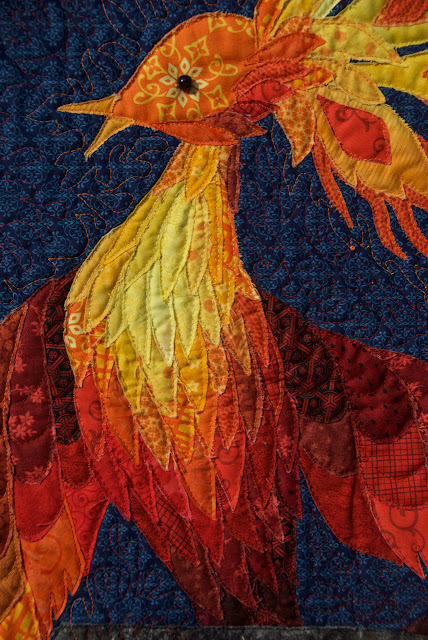 I literally gasped when I saw your quilt! 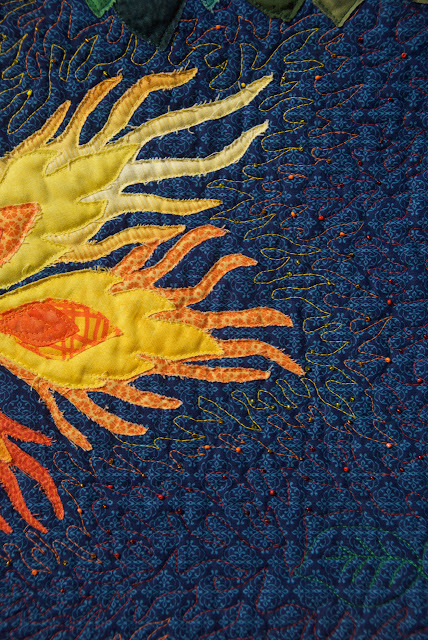 It's one of the most beautiful quilts I've ever seen, and your work is astonishing. You have my vote, and I hope you win! Stunning!!! Very beautiful and to read that it is an original design of yours. You got my vote!! Absolutely gorgeous - a well deserved win! You are a talented craftswoman. I'm late but with my heart : congratulations!! Your work is beautiful and amazing!